I almost missed it. I was in the frozen aisle, casually reviewing the biscuit options. There was something different – this little unassuming bag that did not seem to belong next to the flashy corporate packaging of the Pillsbury and Sister Schubert offerings. Could it be? Ok – let me back up a little. I don’t go to just one grocery store. In fact, if I add them up, I’ve been to over 15 different grocery stores just in Nashville in the last few years. Oh my. I’ve never counted before. That is a lot of stores. Anyway, this is partly because the little grocery store nearest where I live is tiny and crowded and has not had the best reputation. When I first moved to the east side of town nine years ago, I was afraid to go to this store after dark. Aside from the security issues, the selection was very limited and the produce unreliable. It has improved a lot over the years but is still small. So I got into the habit of trying out different grocery stores in different parts of town. I go grocery shopping on a whim, just because I happen to be out with friends or visiting my mother in a nicer part of town where there is more than one spacious, clean, and fully stocked store. Because I really like grocery shopping! I always have. I like walking up and down the aisles looking at the incredible variety of products. I like seeing what is new and pondering the use of the more obscure items in the international sections. I mourn the loss of discontinued favorites while i rejoice in the introduction of the new. Given all that, it should come as no surprise that every time I pass the biscuit sections of a store, whether refrigerated, fresh, or frozen, I am alert and on the lookout for something new. Last week, after having a lovely afternoon visit with my mother, I went to Publix. I was in the frozen aisle, just casually reviewing the biscuit options. Then I saw it. This little package that was almost obscured by the Pillsbury and Sister Schubert offerings. Could it possibly be biscuits? I opened the case and pulled out this little plastic bag with a picture of someone’s grandmother on it. 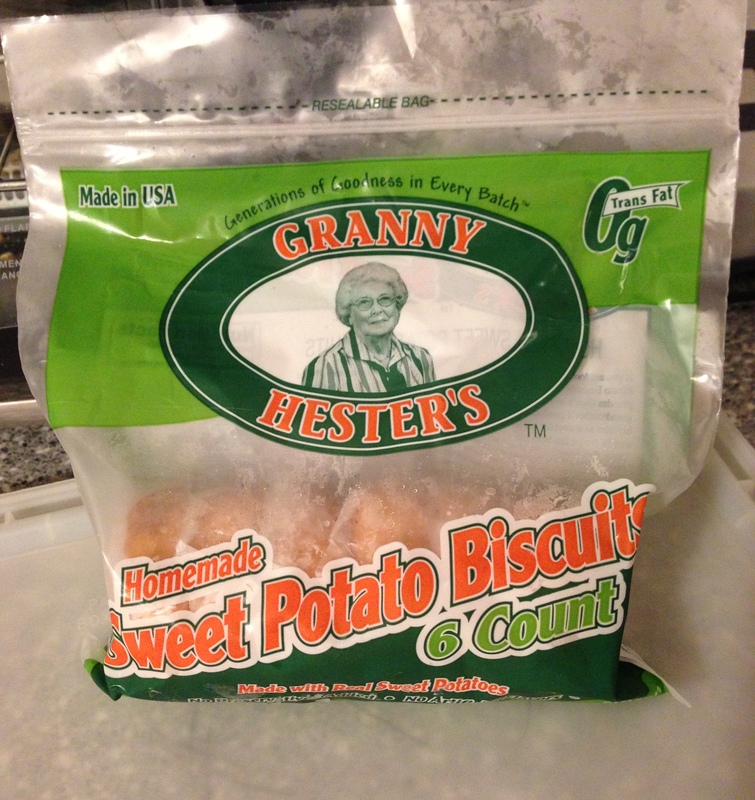 Granny Hester, to be specific. There were six orange disks inside. 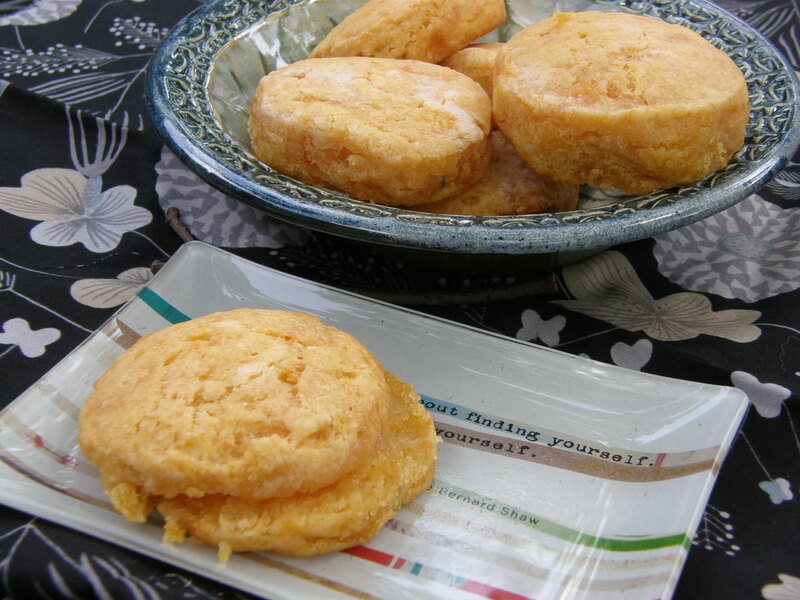 Sweet potato biscuits! I felt like I had found a pot of gold. I baked them over the weekend. They did not rise very much but that seemed to be due to the large proportion of sweet potatoes and relatively small amount of flour. They were quite sweet and we definitely did not need any of the strawberry jam I had pulled out of the fridge. 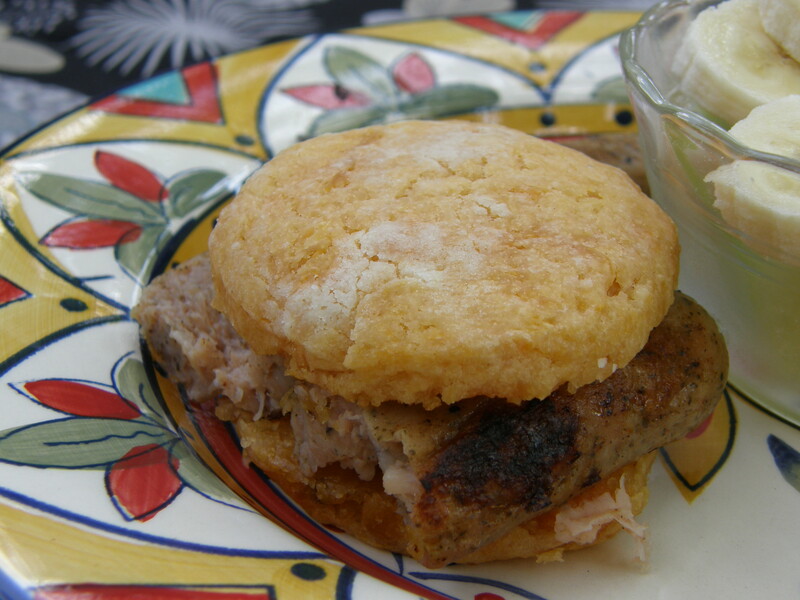 They were great with chicken sausage, although a spicier sausage would have been an even better foil for the sweet. The next day I did the Toast Test. 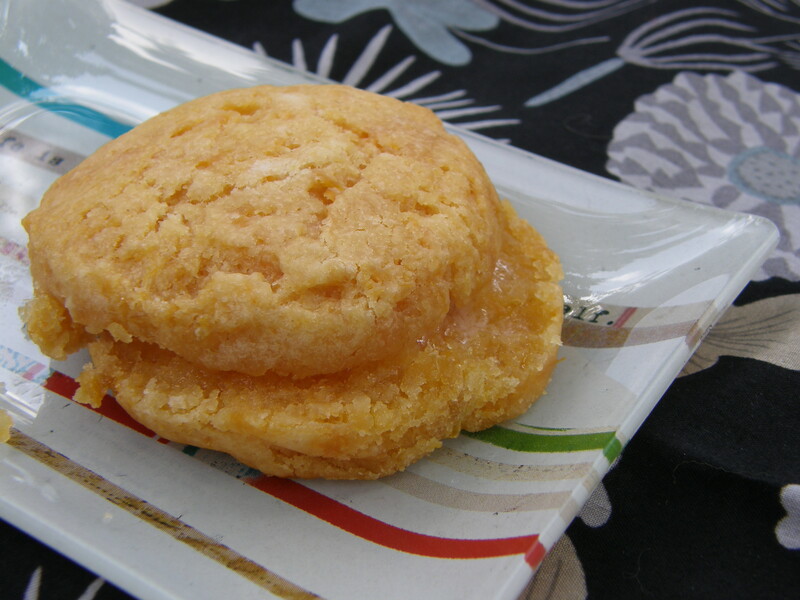 I split the one leftover biscuit (yes, only one was left) and put a healthy dollop of butter on each side. You have to put enough butter on them – don’t skimp! Then they went into the toaster oven which was preheated to about 375 degrees. I toasted them for at least 12 minutes, maybe 15. I think that is the key to the best crispy, crunchy, toasty biscuits – cooking slowly in an oven that is not too hot. Oh. My. Word. 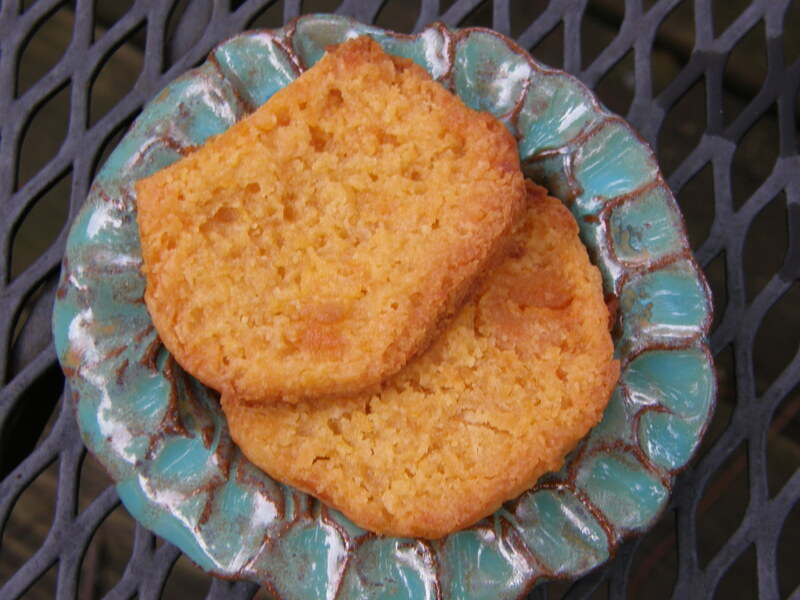 These biscuit halves were transformed from good biscuits into caramelized crispy shards of sweet potato perfection. They were like candy. The only problem is that there were not enough of them. Bottom line? I really liked these. But rather than buy them again, I’m feeling inspired to make my own next time. It will be fun to see if I can meet the Granny Hester standard.